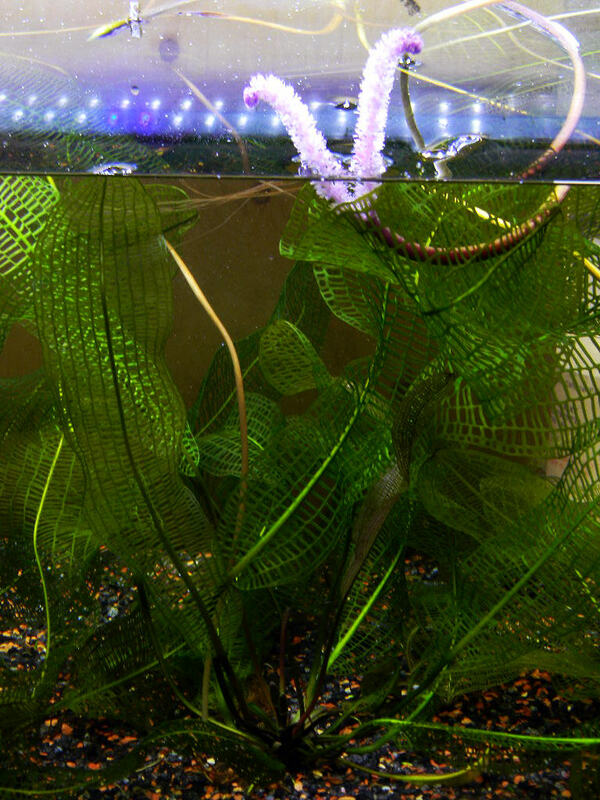 Let me introduce you to the wonderful world of the lace plant, Aponogeton madagascariensis. Aponogeton madagascariensis. 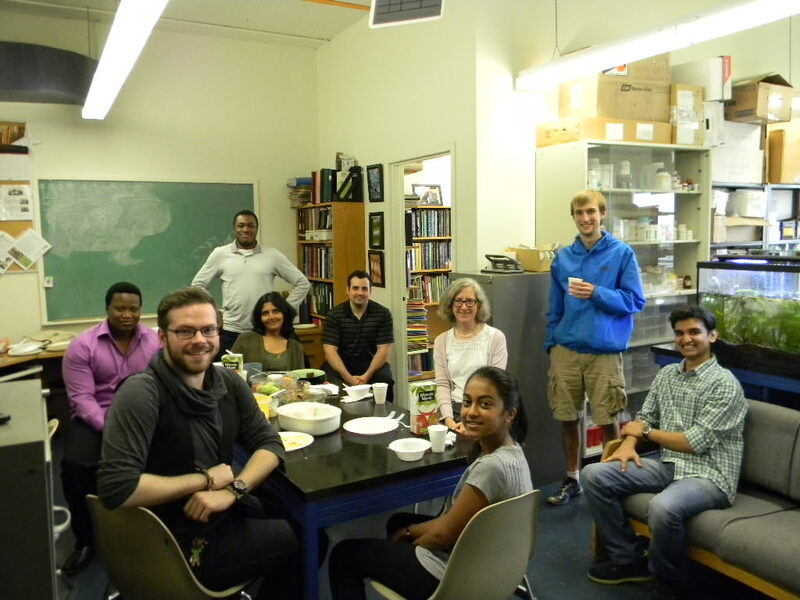 Photo: Adrian Dauphinee (Gunawardena lab). This exotic species native to streams in Madagascar has travelled far to become the focus of the lab of Prof Arunika Gunawardena at the University of Dalhousie in Halifax Nova Scotia. I was fortunate this week to be invited as external examiner for one of Arunika’s PhD students Gaolathe Rantong who gave a beautiful presentation on this fascinating plant. The lace plant is aptly named as its mature leaves form a delicate lattice of perforations (see right) and Arunika’s lab has been asking how these holes form. Most leaves are sculpted by differences in the growth of their cells resulting in the myriad of shapes we are familiar with. But in just two plant families: Monstera and Aponogeton evolution has taken a different course and the final shape is dictated instead by selective death. Reminiscent of the cell death that forms human fingers, here too cells are programmed to live or die to sculpt the forming organ. In the case of the lace plant leaves start life intact and then windows are formed in an ordered pattern resulting in its lace-like appearance. Elegant pharmacological, and laser-capture microscopy experiments are beginning to throw light on how these windows are opened. A window in Aponogeton madagascariensis. Photo: Adrian Dauphinee (Gunawardena lab). 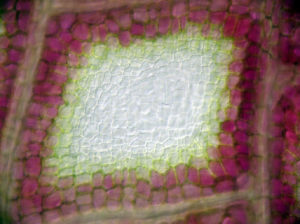 Cells are targeted for destruction at the centre of the window, a process that involves the plant hormone ethylene. Rantong has started to probe the action of gene regulation in this process, and has shown that the ethylene receptors play an important part in marking cells for life or for death. Cells at the centre of the window switch on less of a particular ethylene receptor gene (AmERS1c) compared to the surrounding cells that do not die. 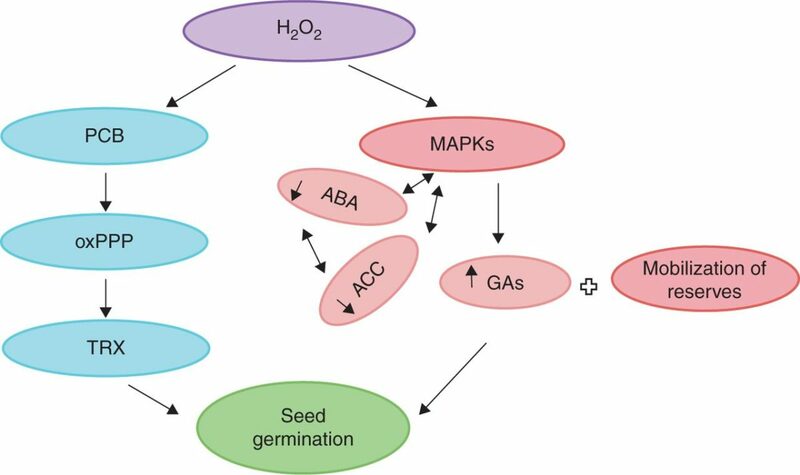 This differential expression is thought to result in a stronger ethylene signal in the targeted cells, and this in turn switches on genes coding for a class of proteases called vacuolar processing enzymes (VPEs). 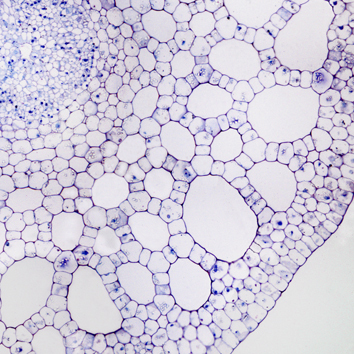 VPEs are thought to play an important part in the destruction of plant cells during programmed cell death. So this exotic plant is proving an excellent tool to study fundamental principles of cell death. Front row (left to right): Jacob Fletcher (graduate student), Anisha Rajaselvam (Arunika’s daughter), Piyush Mishra (visiting graduate student). During my short visit I was made to feel quite part of this young and vibrant group and through the exceptional hospitality and care of my host was also given a glimpse of the beautiful flora of Nova Scotia including vistas of flowering pitcher plants which are worth a visit in their own right. My visit was further rewarded by Arunika’s lace plants finally flowering : producing two elegant spikes of lilac flowers that emerge from the water and give the promise of the seeds for more exciting experiments. My research focuses on gene expression changes elicited by stress in plants and fungi. In particular I am interested in interactions between stress and senescence/ cell death. 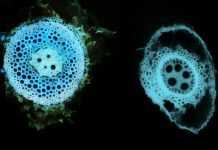 This work has focussed on three areas, Plant organ senescence and responses to stress, Genes regulating the effects of stress on plant cell division, and Stress induced during mycelial interactions between competing fungi. 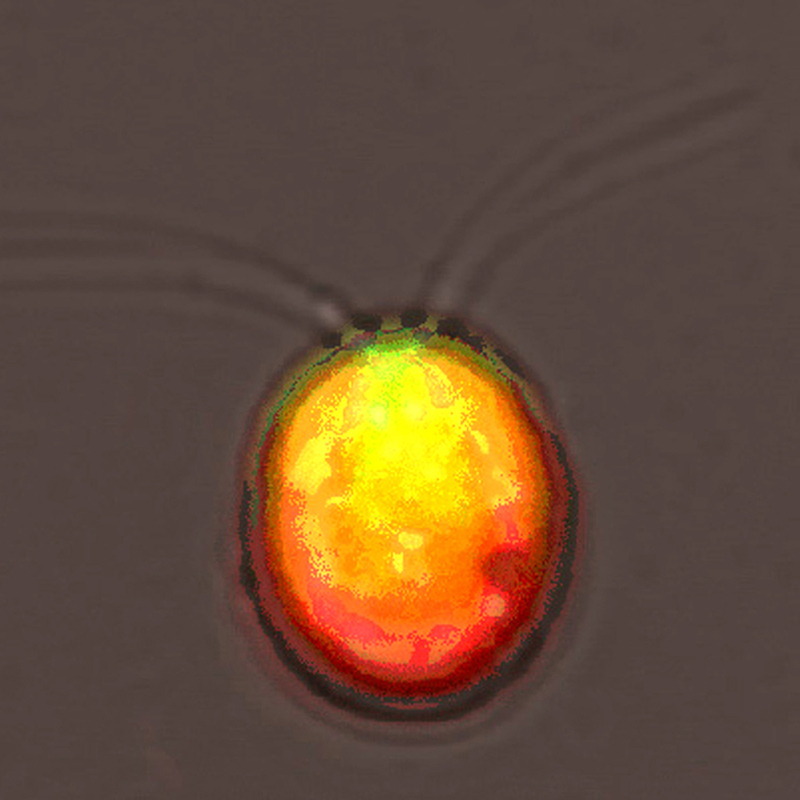 I also collaborate on other projects to understand microbial/plant interactions relating to fungal and bacterial endophytes, and in the use of molecular markers to assist in fungal taxonomy and ecology.